If you've been charged with a crime, you need immediate relief to lessen your worries and to take charge of your situation. In your heart you know that you have nothing in common with criminals who belong behind bars. And yet, you face possible imprisonment and a permanent criminal record if you are found guilty. You need someone to Ease Your Mind during this critical stage. The decisions you make now will affect the rest of your life. We can help. 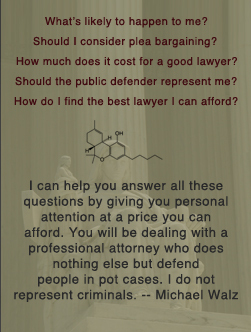 Attorney Michael Walz personally handles every case. Your future will never be handed off to a lower quality attorney. Copyright © 2014 Michael Walz. All Rights Reserved.